Recently I came across the wonderful TED talk by Simon Sinek and his speech was like “I was thinking about the same thing!” to me. But he was brilliant summarizing it. It works for any company. We are not Apple, we are not selling computers, we sell services – software development services. But it works for our company too! I spent a lot of time talking to the top managers and hr department about “why”, but now I even have a respected source to mention and a great illustration to it. So I spent some time and went through exercise – how our company can use this. Let’s start with the description of the idea itself. 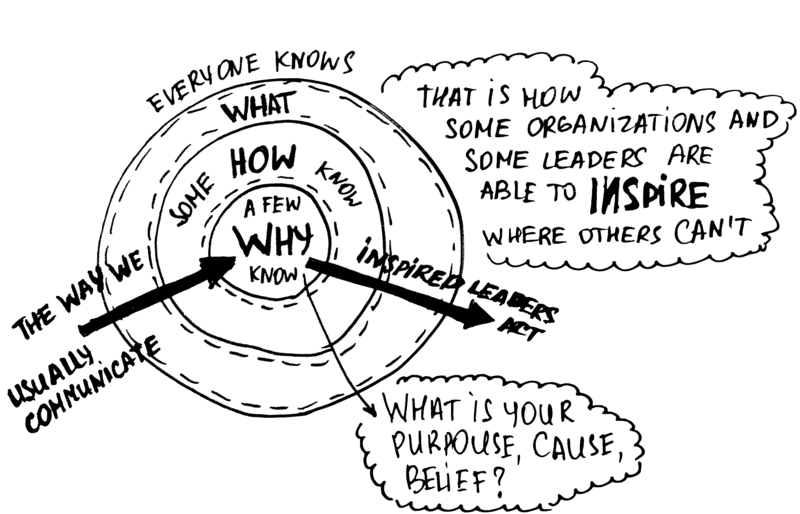 Start with the why – it is a very simple mantra that Simon Sinek devoted his career to. Why we are doing something? As Sinek explains, how a customer “feels” about a product or company – or more precisely how a product or company makes the customer “feel” – plays a much more subtle but powerful role than what we might suspect. “We naturally communicate from the outside-in, we go from the clearest thing to the fuzziest thing. We tell people WHAT we do, we tell them HOW we’re different or special and then we expect a behavior like a purchase, a vote or support. When we communicate from the outside in…[the WHAT level] like features and facts and benefits, it just doesn’t drive behavior. When we communicate from the inside out, we’re talking directly to the part of the brain that drives behavior”. This perhaps is a simple explanation for marketing best practices that tell you that your web site, your messaging and your “branding” has to first connect with a prospect on an emotional level (the WHY). Only then does the presentation of features, facts and figures help rationalize a decision to buy your product or service. But our real WHY is money! In one of my previous posts I wrote about the company philosophy. This Why is completely connected with it, I would even say it is company philosophy itself. It provides our customers not only the understanding “Who you are?”, moreover, when all those pieces are aligned, it gives us a filter through which to make decisions. On all levels – from developer to Project manager and CEO of the company. So, let’s take my company. Our slogan on website is “We Build Software. Intelligently.”, we have plenty of information how we build software – process, technologies. We persuade our client “We guarantee 100% satisfaction with our services.” We have 100500 pages about what we are doing. But where is Why? What do we believe? The task to find out if we have Why is simpler for me as the insider, and I am sure we don’t have strong Why now. Do I need to tell you now How we develop it? Do you care if we have Scrum or Waterfall? Of course it’s just an exercise, to create our real Why we should collaborate with the founders/managers/team members to find it and bring to life. Here you can find more about Simon Sinek – https://www.startwithwhy.com/. 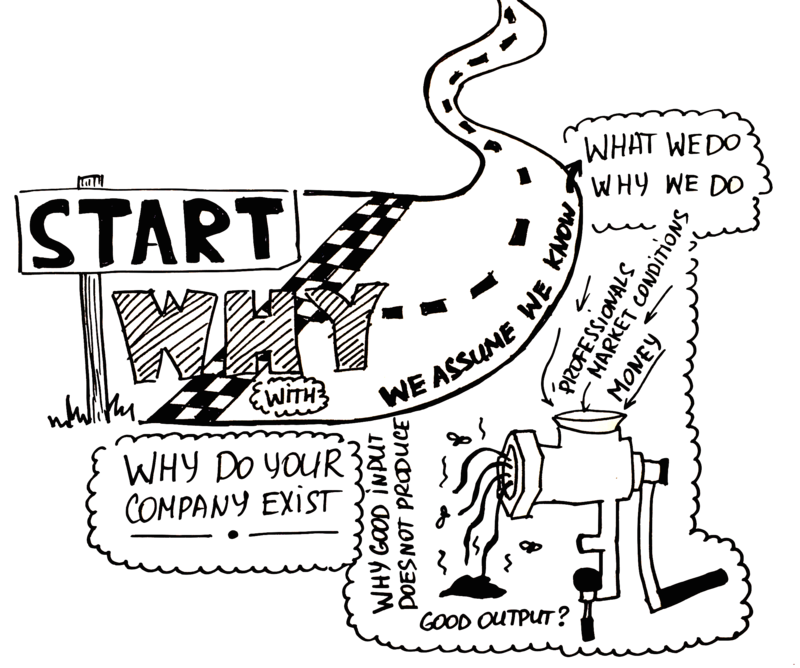 This is a request to use the second image in the 2015 blog post Why Start with Why in a free online course for educators. Credit will be given with a thanks for granting permission. Sure, you can use it! Thank you for contacting me!